London Victoria: the end of the line. 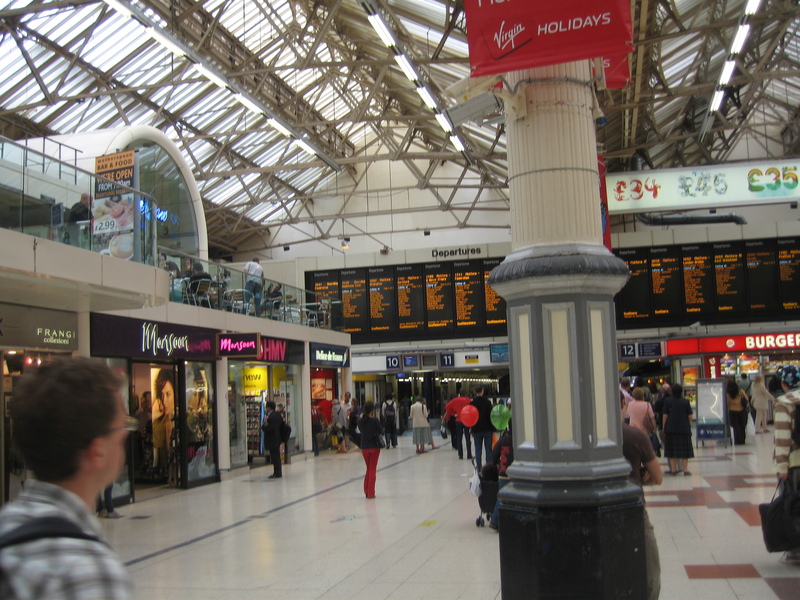 London Victoria: the end of the line. It is for me. If I want to go into London, as I occasionally do, chances are I’ll be arriving in this unlovely station, rail hub for the South of the city, nestled between Westminster Cathedral to its east and Buckingham Palace Gardens to the North. Sounds nice, doesn’t it? Except Victoria was blighted by bombing during the Blitz, and many of the byways near to the station are lined by Sixties monsters, ugly buildings made of concrete and glass. The station itself is a depressing place. Always heaving with people, it’s a characterless zone of rubbishy commuter shops. My train pulls into platforms 9 or 10. Electronic barriers and concrete greet you. You’d never think history had profoundly touched this place. Ninety years ago tonight, it did. At platform 8, at 8.32 p.m., November 10th 1920, a train pulled into the station, carrying something that would soon become immeasurably precious to those British people still mourning the dead of the First World War. That thing was the body of an unknown British soldier. Previously, in act of elaborate symbolism, the bodies of four dead soldiers of unknown identity were exhumed from Ypres, Somme, Arras and Aisne. From these one was chosen ‘blindly’ to represent all the ‘unknown’ British soldiers– those soldiers without a name on their grave, or a grave at all. The body of this soldier, amidst much reverent ceremony, was shipped home to London. It arrived at Victoria the night before its transfer to a final resting place. 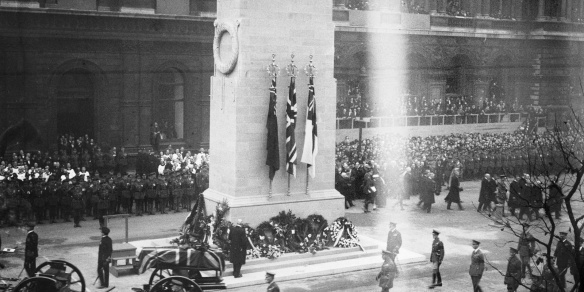 The Cenotaph, 1920. 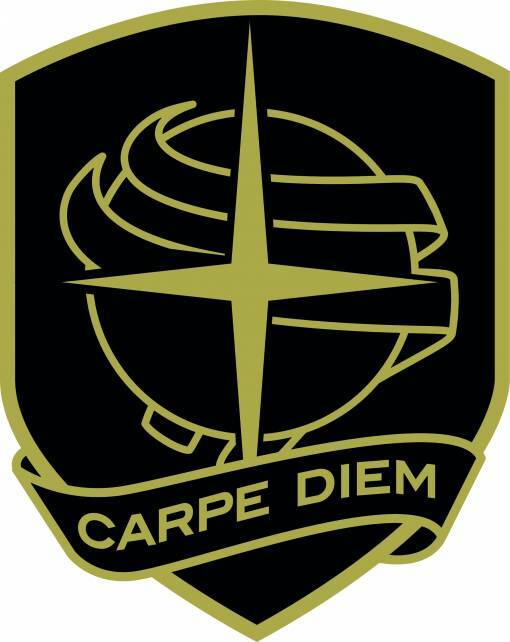 Note the coffin of the Unknown Warrior, bottom left. 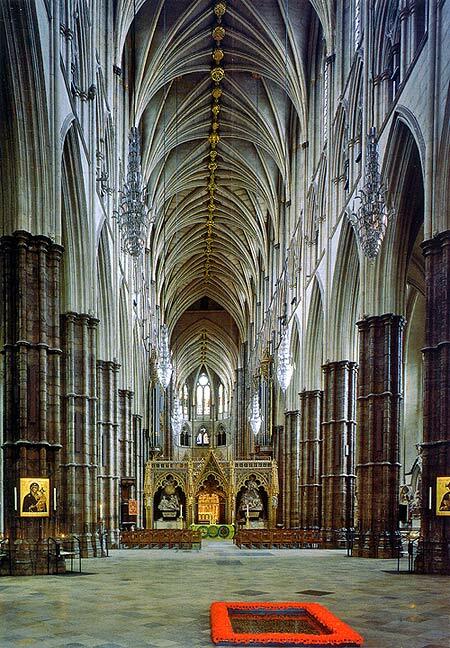 The next day– the third Armistice Day– that soldier would be buried in Westminster Abbey. The coffin bearing the body was taken by carriage to Whitehall, where a new memorial to World War One, the Cenotaph, was unveiled by King George V. From there the king and the government’s ministers followed the coffin to the Abbey, where the body was buried in soil taken from the battlefields of Ypres, “where so many of [the soldier’s] comrades had lost their lives”. The Tomb of the Unknown Warrior, its dedication inscribed into black Belgian marble. The act of burying this ‘Unknown Warrior’ was profoundly moving for many in the country. Many families across the nation had lost fathers, brothers and sons in the four years of war; too many families had no grave to visit to mourn their losses. It is a horrifying Commonwealth Graves statistic (found on the excellent 1914-18 website) that of all those British and Commonwealth forces killed in the First World War, 526,816 men have no named grave. Furthermore, while these dead men are listed on WWI memorials, of that figure 338,955 men were never buried at all. Their identifiable remains were never traced. That sickening fact alone explains why the act of honouring this anonymous soldier drew tens of thousands into the streets on the 11th, and many thousands more to the grave itself in the months and years to follow. Some may have felt that it was their loved one who was buried at the entrance to the Cathedral; many more will have found consolation in the country’s deep gesture of respect for the unknown dead. 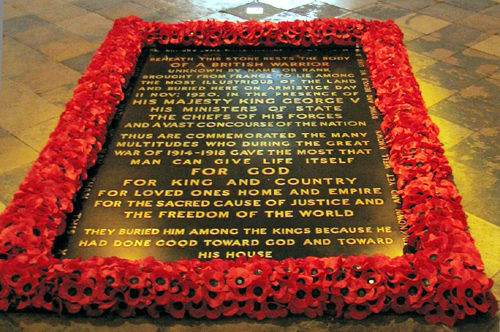 The Tomb of the Unknown Warrior was a profound moment in the mourning of many people in Britain in 1920, and it remains a focus point for remembrance today. Tomorrow, the grave of the unknown warrior will again be revisited with a wreath of poppies, signifying that the country has not forgotten the sacrifice of the body below the stones. Tonight, as has happened every November 10th since 1920, a small ceremony was held at Platform 8, Victoria Station, London, to remember the arrival of the unknown soldier. There’s something heartening in the continuity of that ceremony, I think: progress, after all, means embracing the new, and honouring the best of the past. If you get the chance, and are someday stuck in the grim extended waiting room that is Victoria station, walk along to Platform 8 and pay your respects too. If you want to learn more about the tomb of the unknown warrior, you can find out about it on the web. There’s an excellent page on the soldier and grave at the Imperial War Museum’s Collections; another at Home of Heroes; a good history with an amazing video of the actual passage of the body from France to London at the Westminster Abbey website; and a short account on the BBC history pages.